The cognitive and visual capabilities of mice are being upgraded thanks to a study by a Keio University professor showing that they can distinguish the painting styles of different artists. Professor emeritus Shigeru Watanabe became intrigued by the possibility that mice can discern or even prefer the works of one artist over those of another when he noticed that one of many mice in his laboratory seemed to show a preference for Renoir over Picasso. In a more carefully structured experiment he showed mice paintings by Wassily Kandinsky, the Russian father of abstract painting, and Piet Mondrian, the Dutch neo-plasticist. Their works are fairly easy for most humans to distinguish. Kandinsky’s paintings are often turgid studies of inner turmoil while Mondrian’s are characterized by the use of straight lines and rectangular blocks of primary colors. Watanabe had his mice look at 10 paintings by each artist. To provide motivation for distinguishing the two sets of paintings, he injected the mice with morphine while they were perusing the work of one artist and with a saline solution while they were exposed to the paintings of the other artist. Later the mice were allowed to move about freely among the two sets of paintings. All mice were found to spend much longer periods of time in front of the paintings they had initially enjoyed under the pleasurable influence of morphine. The same results were found regardless of which artist’s works were paired with morphine, showing that mice have the capability to discern the difference between their styles of painting. To dissociate the results from morphine per se, Watanabe repeated his procedure using milk as the stimulus paired with one set of paintings. Even when the mice were shown entirely new paintings, in 80% of the time they were able to discern the works of artists with whose works they associated the milk treat. The mouse study seems to suggest that outside of study settings in which the works of artists are paired with differing stimuli, mice rarely have a preferences between two artists. “Analysis of individual mice revealed only one mouse out of 20 mice displayed some preference for Kandinsky during 6 days of the test (t(5) = 2.53, P = 0.053), suggesting the rare possibility of picture preference in mice,” Watanabe noted. However, the study does clearly show that they possess the sensory and cognitive capability to make such discernments. It may prompt a reconsideration of the way in which mice are routinely used in studies designed to reveal the impact of various stimuli on memory, motivation and cognition. Mice have generally been considered to have acute sense of smell and hearing but rather poor visual skills. Watanabe’s study was published in the US academic journal PLOS ONE under the title “Preference for and Discrimination of Paintings by Mice”. 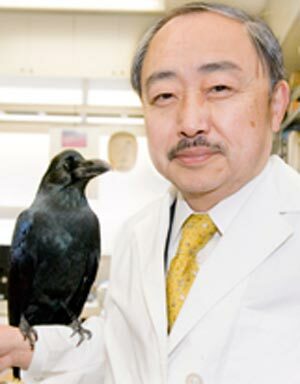 Keio University psychology professor Shigeru Watanabe believes mice and birds may possess the faculties to be art critics.